(MENAFN - Zion Market Research) Zion Market Research has published a new report titled 'Patient Engagement Solutions Market by Component (Hardware, Software, and Services), by Delivery Mode (On-Premises and Cloud-Based), by Application (Health Management, Social and Behavioral Management, Home Health Management, and Financial Health Management), by Therapeutic Area (Chronic Diseases, Women's Health, Fitness, and Others), and by End-User (Providers, Payers, Individual Users, and Others): Global Industry Perspective, Comprehensive Analysis, and Forecast, 20182025. 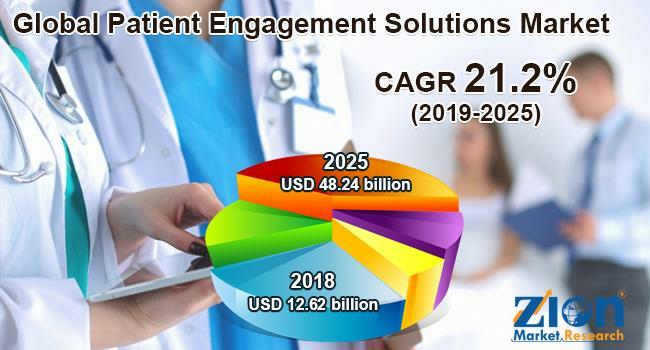 According to the report, the global patient engagement solutions market was valued at approximately USD 12.62 billion in 2018 and is expected to generate around USD 48.24 billion by 2025, at a CAGR of around 21.2% between 2019 and 2025. Patient engagement refers to the process of enabling the active involvement of patients, caregivers, families, and healthcare providers in self-care to improve the quality of care, enhance safety, and offer patient-centric health care delivery. The worldwide demand for patient-centric care is growing rapidly, owing to the need for better patient outcomes and improved interaction between healthcare providers and patients. Government initiatives and regulations to promote and implement patient-centric care, increasing the popularity of patient engagement solutions among the elderly patients, and the wide adoption of mobile health solutions are major factors driving the growth of the patient engagement solutions market globally. The global patient engagement solutions market is segmented based on component, therapeutic area, application, delivery mode, and end-user. Based on the component, the market is segmented into hardware, software, and services. The software segment is sub-segmented into standalone solutions and integrated solutions. The services segment includes consulting services, implementation services, training and education services, and others (post-sale and maintenance services, advertising services, and enrollment services). The software segment held the largest market share in 2018. The services segment is expected to register the highest CAGR over the forecast time period. By delivery mode, the market includes on-premises and cloud-based. The on-premises segment held the largest market share in 2018, whereas cloud-based segment is expected to register the highest CAGR in the years ahead, due to the scalability, flexibility, and affordability of cloud-based solutions. By application, the market includes social and behavioral management, health management, financial health management, and home health management. Health management dominated the market in 2018, owing to the escalating awareness among patients about disease complexities and patient willingness to maintain their health. Providers, payers, individual users, and others comprise the end-user segment of patient engagement solutions market. Providers are split into hospitals and physicians. Payers are split into private and government payers. Others include employer groups, government bodies, and pharmaceutical companies. Healthcare provider segment dominated the market in terms of revenue in 2018, owing to the increasing adoption to maintain competitive advantage of patient engagement solutions by the healthcare providers. By therapeutic area, the global market is segmented into chronic diseases, women's health, fitness, and others. Chronic diseases dominated the global patient engagement solutions market in 2018, owing to the increasing prevalence of cancer, diabetes, obesity, cardiovascular diseases, infectious diseases, etc. Chronic diseases are further classified into diabetes, cardiovascular disease, obesity (weight loss management), and others. By region, North America dominated the global patient engagement solutions market and accounted for about 40% market share in 2018. This regional market is expected to dominate globally over the forecast time period as well, owing to the increasing number of Accountable Care Organizations (ACO) and rising need to reduce healthcare costs and hospital re-admissions. Europe held the second position in the global patient engagement solutions market in 2018, due to the growing need for efficient healthcare delivery and advanced healthcare solutions. The Asia Pacific is projected to grow rapidly over the forecast time period, owing to the rising use of mobile health solutions and the increasing smartphone penetration across the region. Some key players of the global patient engagement solutions market include McKesson Corporation, Allscripts, IBM, Athenahealth, Cerner Corporation, Orion Health, Getwellnetwork, Lincor Solutions, YourCareUniverse, WelVU, Get Real Health, Oneview Healthcare, Medecision, Inc., and Phytel, Inc.